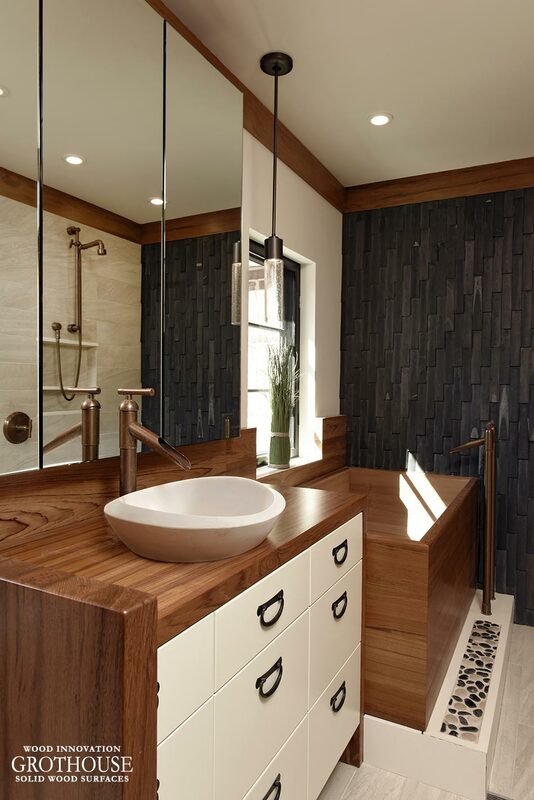 Wood is naturally a warm, comfortable material, which is why some of the industry’s best designers choose custom wood bath surrounds for luxurious master bathrooms. The most popular wood specie selected for wood bath surrounds is Teak. This is due to its natural waterproof high natural oil content. Teak is actually one of the most common woods used for yachts. 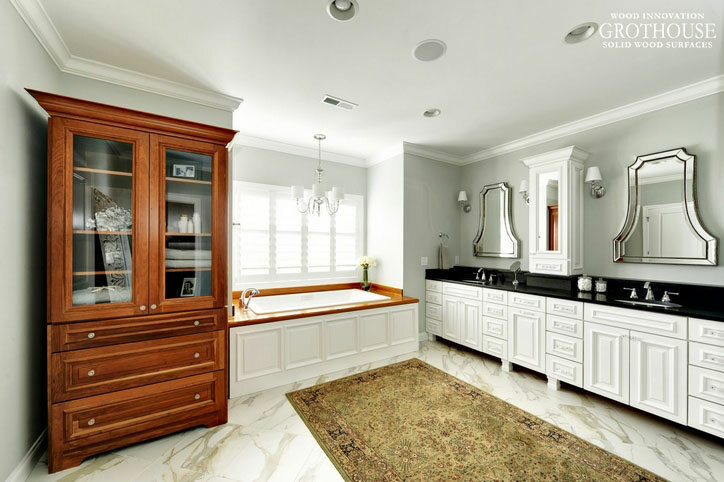 An elegantly traditional master bathroom designed by Echelon Custom Homes includes a custom Teak wood bath tub surround. It was designed as an accent piece to cover only the top of the tub. The wood was finished with Durata® Waterproof Permanent Finish in Satin sheen. 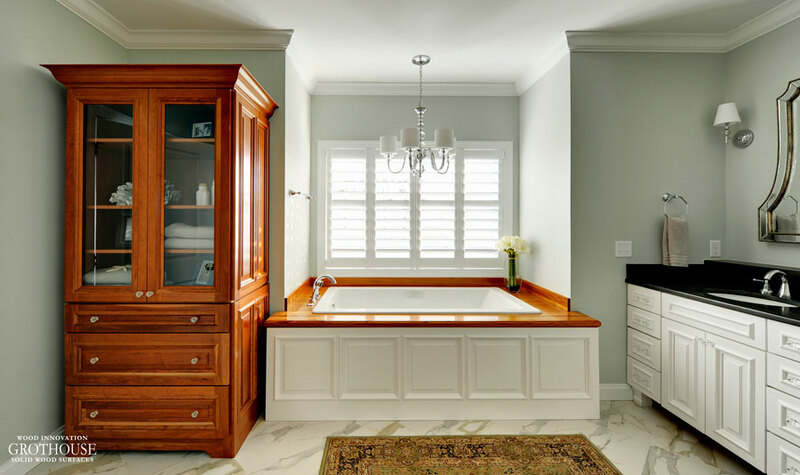 Matching perfectly with the hutch aside of the tub, the wood also complements the marble floor and white bathroom cabinetry. 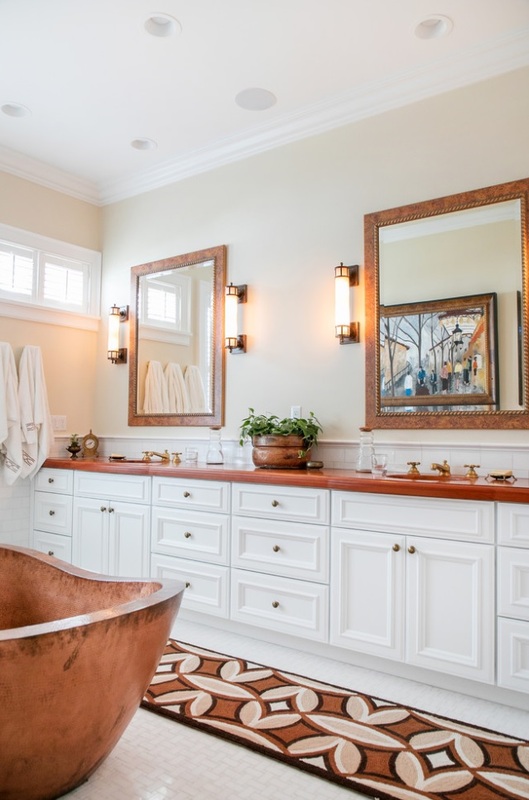 This bright bath has a spa like feel. While it is spacious, it still remains warm and calming. A contemporary Asian-inspired master bath designed by Jennifer Gilmer Kitchen & Bath includes a wood bath surround. Wood baths are popular in Asian-inspired spaces, as they reflect a calming, spa-like appeal. The entire tub itself is made of Teak wood. 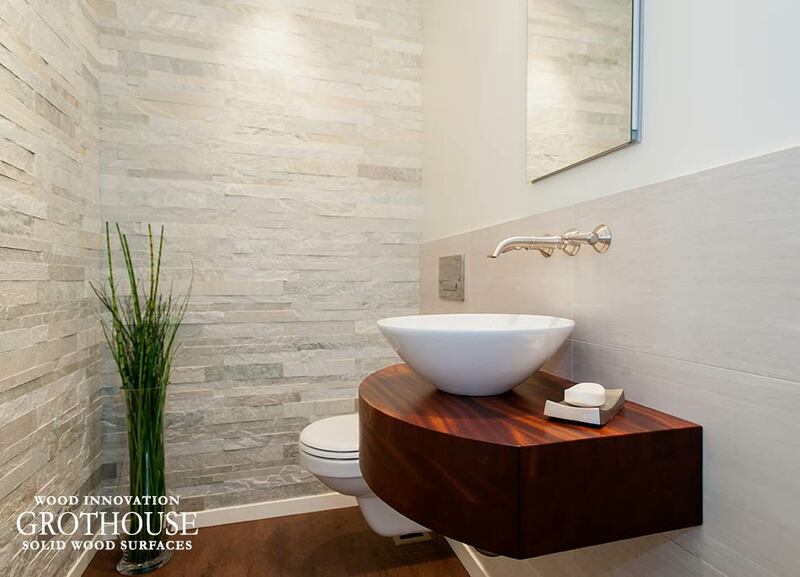 Grothouse crafted a custom wood countertop and divider wall to match the tub. The wood was stained with Grothouse The Favorite Stock Stain (#03012) and finished with Durata® Waterproof Permanent Finish in Matte sheen. Visit the Grothouse Countertop Image Library and like @grothouseinc on Instagram to see more custom wood bath surrounds! 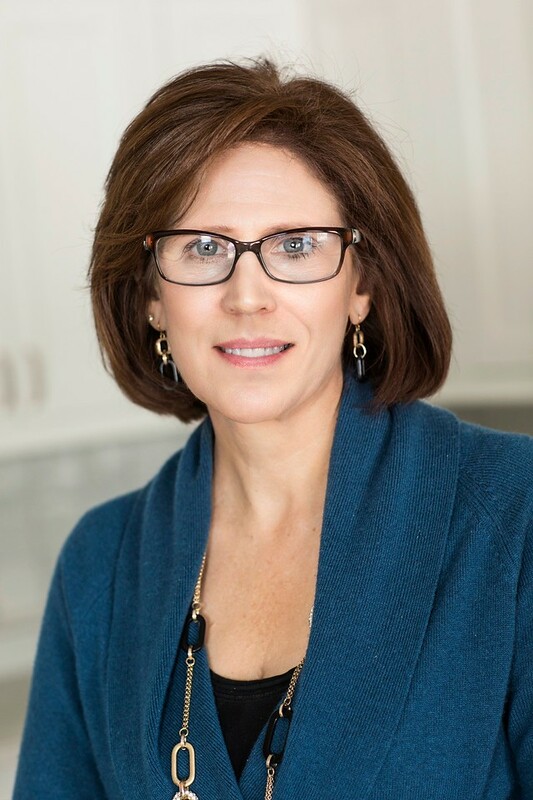 Jennifer Ott wrote an article for Houzz, Will These 10 Colors Be Big in 2018? discussing the colors paint manufacturers are rolling out for 2018. 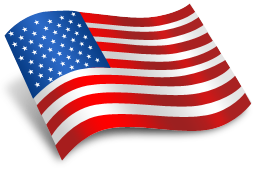 Among these colors are various shades of blue, some including green and others gray. No matter the tint, blue always has a cooler tone. Because of this, designers tend to incorporate wood into blue designs to add warmth. 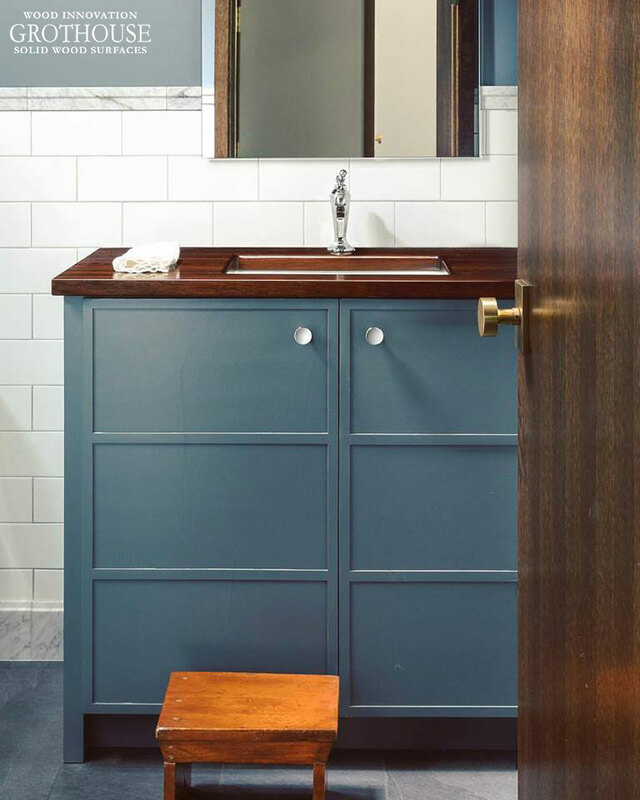 Lauren Tolles of Maison Birmingham designed an edge grain Peruvian Walnut countertop for this blue vanity. The wood countertop makes this informal family powder room feel unique and warm with a modern twist on traditional design. 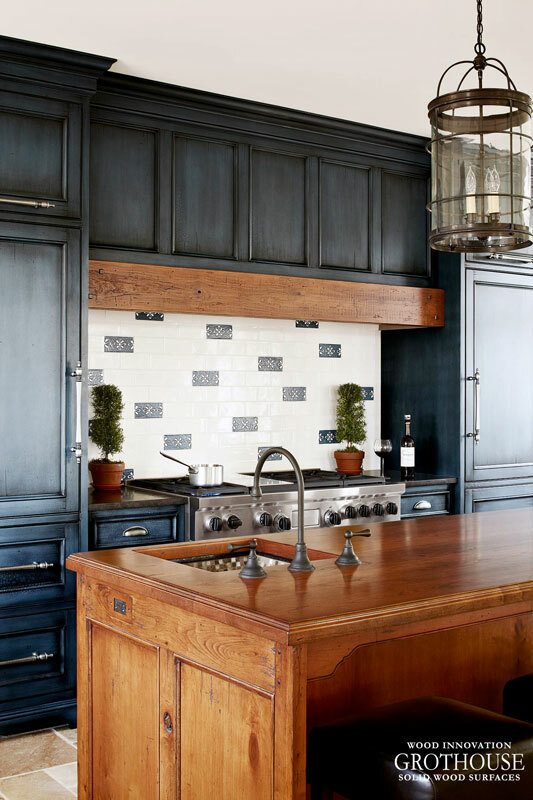 Heidi Piron designed a distressed American Cherry wood countertop to match the island in this otherwise all blue kitchen. The rich warm brown and red tones of the wood add warmth against the cool, bright blue cabinets and make the kitchen island the focal point of the kitchen. The hood includes a matching wood band to tie in the island. 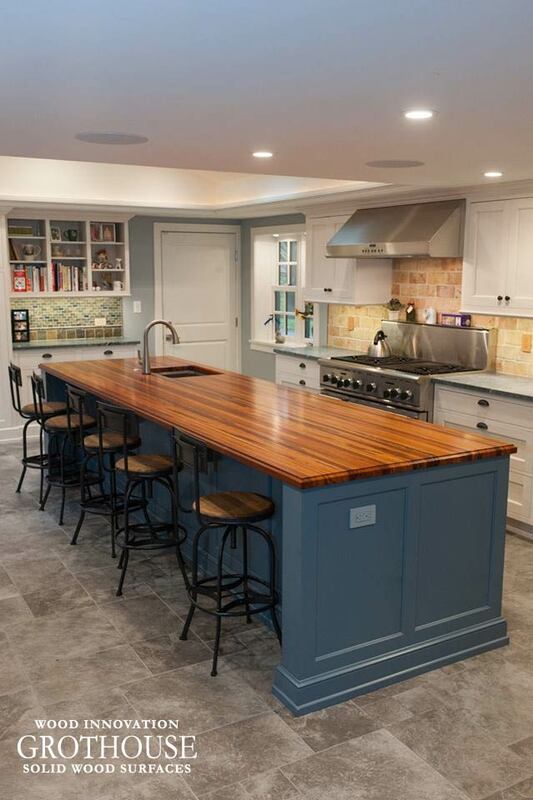 Pine Street Carpenters, Inc. designed an edge grain Tigerwood countertop for the large blue kitchen island in this white kitchen. 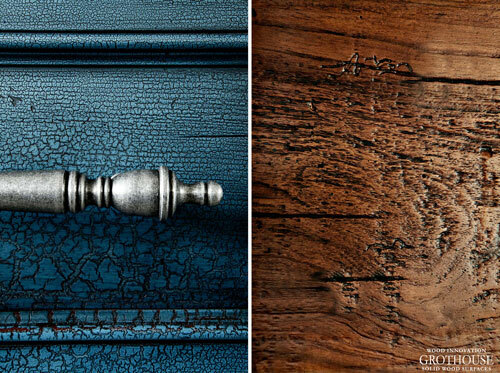 Visit the Grothouse Countertop Image Library to view more blue designs featuring wood countertops. Follow @grothouseinc on Instagram for even more design inspiration. Vessel Sinks on Wood Bathroom Countertops can be the most striking feature in a bathroom, adding style and value to any bath space. Vessel sinks provide an efficient space for your storage needs and bathroom preparation rituals. They are often used for bathroom vanities in modern or contemporary style bathrooms, as opposed to more traditional drop-in or pedestal sinks. However, when paired with a wood countertop, the style can be custom designed to fit any space. Below are inspirational wood countertop designs with vessel sinks. 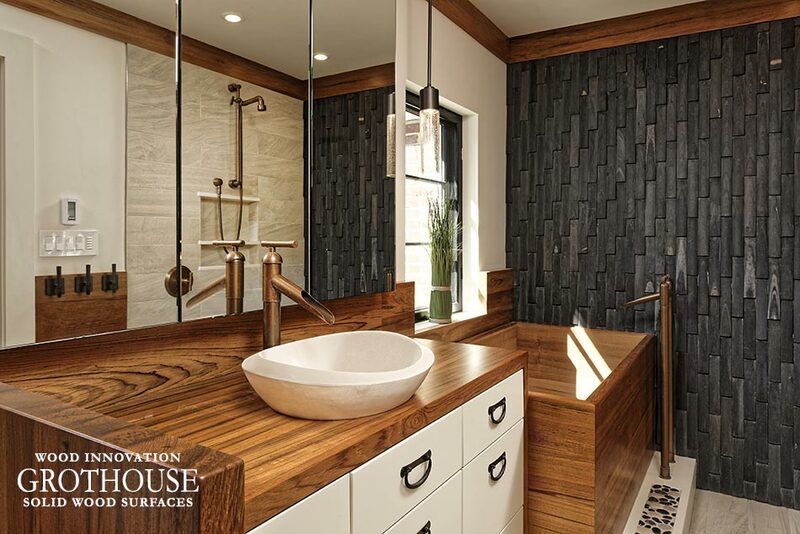 Designed by Jennifer Gilmer and Meghan Browne of Jennifer Gilmer Kitchen and Bath, a limestone vessel sink was placed on a custom teak wood countertop to create this Asian-inspired bathroom vanity. The four inch Sapele Mahogany wood countertop pictured below features a vessel sink and a wall mounted faucet. Cleverly designed by Vawn Greany CMKBD and co-designer Trisha Gaffney AKBD of Collaborative Interiors, the wall mounted faucet helps to free up counter space. 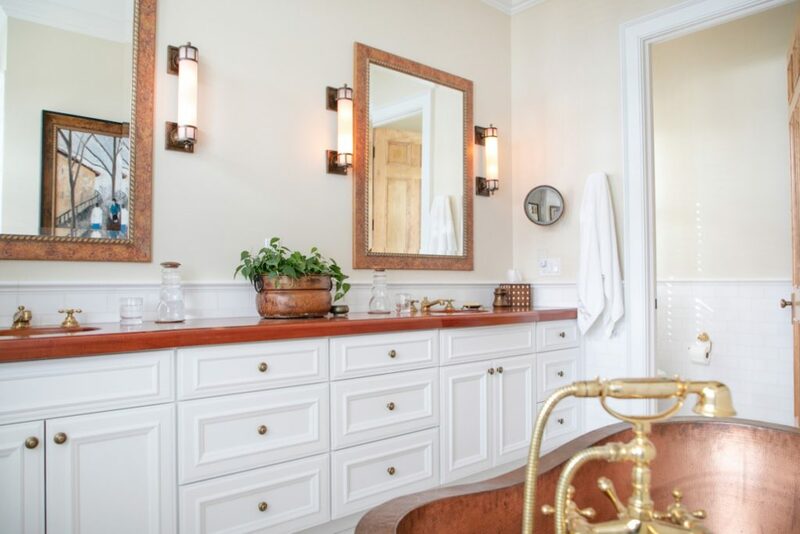 A Wenge Pastore counter was crafted for this large double vanity designed by Jennifer Gilmer Kitchen & Bath as the focal point of this tranquil bathroom. 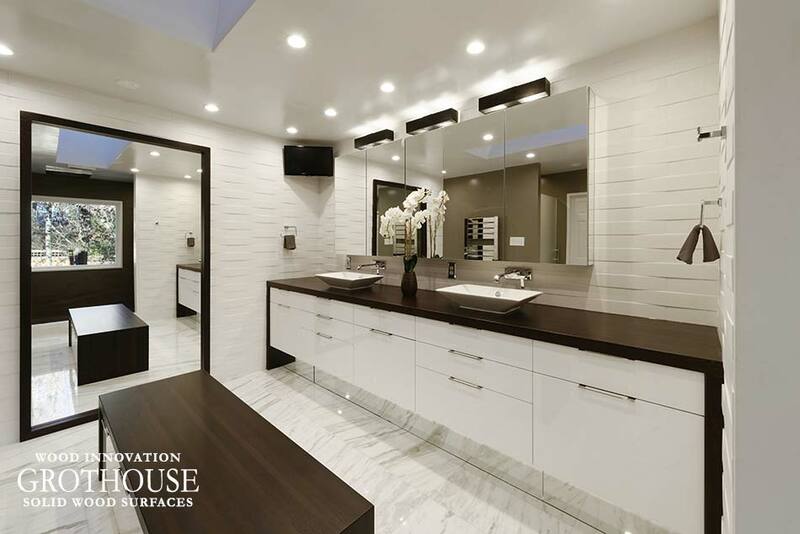 The double vanity houses white vessel sinks, adding interest to the clean space and providing contrast against the dark wood countertop and accents. 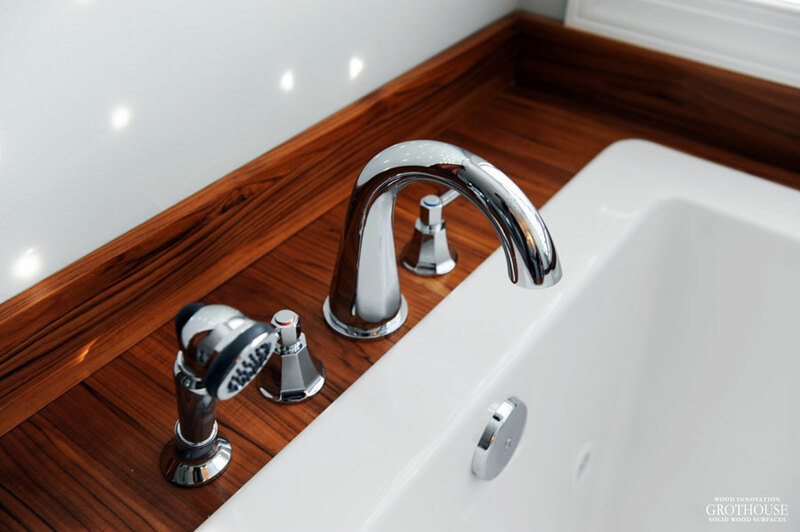 Want to see more bathroom wood countertop designs with vessel sinks? Visit the Image Gallery on our website and like us on Facebook!